KS01-S Dual Surface and Immersion Probe. A time saving product, combining two probes into one. 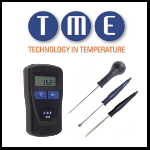 No need to switch probes when dealing with temperature analysis of running water and pipes - simply use this single probe.